“You” or “you” refers to any User. What Constitutes Personal Information? Personal information is any information about an identifiable individual, but may not include certain business contact information that Eassons collects, uses or discloses solely for the purpose of communicating or facilitating communication with the individual in relation to their employment, business or profession. Other information as required or permitted by law, or as provided by you. To contact you for customer follow up and to seek your input and advise you about products and services of Eassons and its affiliated companies, but only your name, address and telephone number will be used for this purpose. We may use your testimonials at our Site and in our promotional and advertising materials, but we shall only do so without your name or without your surname, unless we have further consent from you. You will be given the opportunity to opt out of having your information used for purposes which are not directly related to the provision of our products and services. For example, if you do not want to receive information about additional products and services that may be available from Eassons and its affiliates from time to time, then you will be given the opportunity to opt out of receiving such information. How Long Do We Keep Your Personal Information? We retain your personal information as needed to respond to your queries, and/or as long as you remain our customer. If your relationship with us as a customer ends, we may use and disclose your personal information as required and permitted by law, to conclude any outstanding matters relating to your relationship with us, to contact you for customer follow up, and to seek your input and to advise you about products and services of Eassons and its affiliated companies that may interest you. If you do not wish to receive any such further information, please contact us as indicated under the “Contact Us” heading below. We also retain your personal information as necessary to satisfy any potential legal obligations we may have. 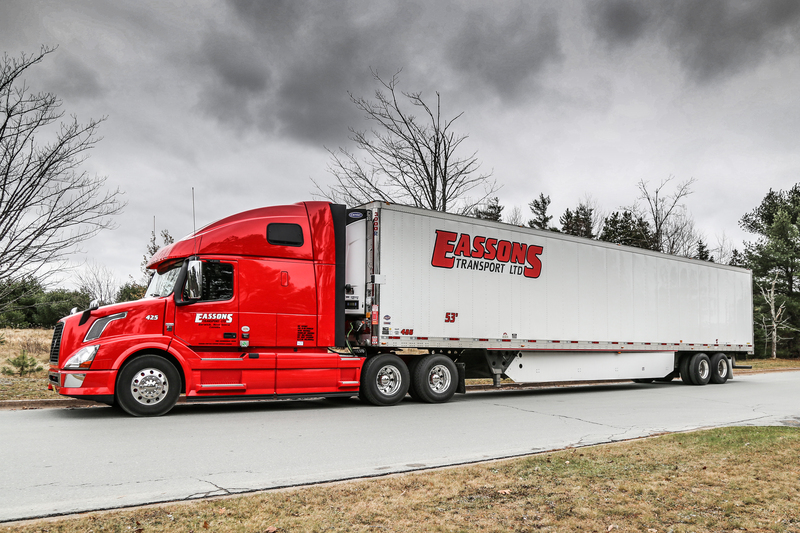 Privacy Officer – Eassons Transportation Group. Please be aware that access may not be provided to certain information which is protected by lawyer-client privilege, constitutes confidential commercial information, was collected in respect of the investigation of a breach of an agreement or of law, or is generated in respect of dispute resolution. These terms and conditions (“Terms“) of using the website (“Site“) of Eassons Transportation Group (“Eassons“). If you do not agree to be bound by these Terms, do not use or access this Site. Eassons may amend these Terms at any time by posting the amended terms on the Site. Your continued use of the Site constitutes your acceptance of any such amendments. All materials on this Site, including, without limitation, text, data, information, images, illustrations, audio clips, video clips, surveys and special promotions, are protected by intellectual property rights owned and controlled either by Eassons or its affiliates and subsidiaries, or by third parties who have licensed their material to Eassons. Material from the Site may not be copied, downloaded, reproduced, republished, uploaded, posted, transmitted or distributed in any way without the prior written consent of Eassons or except as specifically permitted on this Web Site. Modification of material or use of material for any purpose other than your own personal, non-commercial, institutional or home use is a violation of copyrights and other intellectual property rights. The trade marks, logos and service marks that you see on this Site are registered and unregistered marks of Eassons or its affiliates and subsidiaries, or third parties who have licensed the use of such marks to Eassons. Nothing in this Site grants any licence or right to use any marks displayed on this Site without the written permission of the owner of the mark. Your misuse of the marks displayed on this Site or any other content on this Site is strictly prohibited. Eassons makes no representation that materials on the Site are appropriate or available for use in locations other than Nova Scotia. Those who choose to access this Site from locations outside Nova Scotia do so on their own initiative and are responsible for compliance with local laws, if and to the extent local laws apply. Eassons welcomes your comments on our services, including this Site. However, any notes, messages, billboard postings, ideas, suggestions or other material that you submit to this Site will become property of Eassons. Eassons is entitled to use any material that you submit for any type of use forever in any media whether known now or developed later. When you submit material to the Site, you agree that Eassons has the right to publish the material for any use as outlined above including, but not limited to, promotional and advertising purposes, without compensation to you of any kind. Some links in the Site let you leave the Site, and the linked sites are not under the control of Eassons and Eassons is not responsible for the content of any linked site. Eassons is providing these links to you only as a convenience, and the inclusion of any link does not imply endorsement by Eassons of the linked site. The materials in the Site are provided “as is” and without warranties of any kind either express or implied, unless otherwise specifically noted herein. To the fullest extent permissible pursuant to applicable law, Eassons disclaims all warranties, express or implied, including but not limited to implied warranties of merchantability and fitness for a particular purpose, with respect to the Site and any website with which the Site is linked. Eassons does not warrant the functions, information or links contained on the Site or that its contents will meet your requirements, that the Site or its content are fit for any particular purpose or that the operations of the Eassons network or its contents will be uninterrupted or error-free, or that the Site or the server that makes it available are free of viruses, worms or other harmful components. Without limitation, Eassons makes no representations and warranties, express or implied, with respect to any specific merchandise or service that will be available for or obtained by members through the redemption of rewards or otherwise. These Terms are effective until terminated by Eassons at any time without notice. Eassons may terminate your right to use this Site immediately, without cause, without notice to you, in the sole discretion of Eassons. These Terms is governed by and shall be construed in accordance with the laws of the Province of Nova Scotia without regard to conflicts of law. You agree to bring any claims against Eassons exclusively in the courts of Nova Scotia sitting at Halifax. If any provision of these Terms is unlawful, void, or for any reason unenforceable, then that provision shall be deemed severable from these Terms and will not affect the validity and enforceability of any remaining provisions. While every effort is made to ensure that all information provided at the Site does not contain computer viruses, malware or similar harmful devices, you should take reasonable and appropriate precautions to scan for such items and should ensure that you have a complete and current backup of the applicable items of information contained on your computer system. IN NO EVENT SHALL WE, OUR SUBSIDIARIES, OFFICERS, DIRECTORS, EMPLOYEES OR OUR SUPPLIERS BE LIABLE FOR LOST PROFITS OR ANY DIRECT, SPECIAL, INCIDENTAL OR CONSEQUENTIAL DAMAGES ARISING OUT OF OR IN CONNECTION WITH OUR SITE, OUR SERVICES OR THESE TERMS, HOWEVER ARISING, INCLUDING NEGLIGENCE.